My friend Andrew and I decided to film a simple Gospel presentation to share with the world over Youtube this year, and thanks to the great editing by our talented friend Becca (check out her Youtube channel with a short film, music videos, and more! ), we have the finished video to share with you all! Enjoy! This is a simple follow up to my longer post last year about how to share the Gospel, specifically as a Catholic. There’s plenty more that we could have said, but we kept it short and sweet at under 90 seconds. Want to live in relationship with Christ? Say a simple prayer right now asking Christ to come into your life and reveal Himself to you. Make sure to talk with a Catholic friend or your local priest about how you can take the next steps toward joining an RCIA group. A great resource is Catholics Come Home. I’d be more than happy to answer any questions and give advice, as well! How to Share the Gospel: For Catholics! That’s an easy way to understand our situation in a nutshell. The Popes have been pushing for the New Evangelization for 50 years now but it’s taken a while to trickle down to Catholics in the pews. As a Catholic missionary with FOCUS, I’d like to share with you what the Gospel is, why we need to share it, and how to do it. According to New Advent, the word gospel was derived from the Angelo-Saxon god (good) and spell (to tell). It was treated as the equivalent of the Greek word euaggelion (good tidings- usually from an emperor). When emperors had won a battle, they would proclaim the euaggelion to the people. The same way, we share the Gospel, or good news, of our King, Jesus Christ! The word gospel could be used in many different ways. It could be used to tell any generic good news. It could be used to reference a type of music. It could refer to the Gospels in the bible: Matthew, Mark, Luke, and John. The Gospel of Jesus Christ that I am talking about essentially is Jesus, who is revealed most perfectly through the example of the Church and in a unique way in the bible: a book compiled by the Catholic Church. The Gospel essentially is Jesus: His life, death, and resurrection. In my own words, the Gospel is that though we have fallen away from God through sin, Jesus- God Himself!- has given all of humanity an opportunity for salvation through His passion. By believing in Him and joining His Church through baptism and receiving the sacraments, we can hope to partake in His resurrection at the end of time. The Gospel is that God not only acknowledges our existence, but loves us all enough to die for us, and eagerly desires that we live in relationship with Him. Let me begin with a hypothetical situation. Suppose that you hit your friend. All of a sudden, there is tension and discord in your relationship with that person. What can be done to right that relationship? One wise thing to do is to ask forgiveness for what we’ve done. But the relationship is still not right until your friend actually forgives you. There is absolutely nothing that we can do to make them forgive us, it is completely in their power to choose to be merciful or not. Now think about our relationship with God. Unfortunately, we have also broken our relationship with God through our sins. As we learned in Genesis, there are real consequences for disobeying God (aka sinning). Because of their sin, Adam and Eve would now die, struggle to find enough food to live, not be able to trust each other innocently, etc. God has called us to repentance. Before Jesus began His ministry, St. John the Baptist went around Israel preaching repentance. We always need to repent first and ask for God’s forgiveness. But we also need something that we don’t deserve, something that we have no control over: we need God’s forgiveness. Remember, God doesn’t have to forgive us. But the good news is that He did! Thanks to Jesus’s mercy, we can be forgiven if we believe in Him and are a part of His Church: who He entrusted to share the Gospel throughout the world. The Catholic (universal) Church must make disciples of all nations (Matthew 28:19)! We will die with no hope if we die without faith in Jesus. Our eternal souls will be in danger of eternal damnation without Jesus. Every single person that has ever lived can only be saved through Jesus. That’s it. There’s no other way to heaven. Jesus is the way, the truth, and the life (John 14:6). Just being a “good person” isn’t good enough. It is an integral part AFTER we believe in Jesus, but it doesn’t REPLACE belief in Christ, who is truth itself. There is one God and one Lord Jesus Christ. 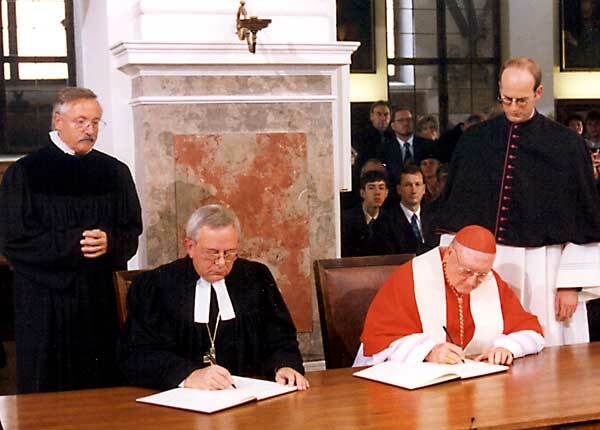 There is one true faith: the Catholic Christian faith. Acknowledging this is not hateful or discrimination but is merely following the truth just in the same way that we teach children that 2+2=4 and not 5 or 3. Living according to the truth is not constraining but rather freeing because it allows us to live the most relevant life possible. What’s the point in living with the dream of being the MVP of the NBA if at the end of your life you end up in Hell separated from God forever? With all of this in mind, I want to remind you that it is not just the duty of priests and missionaries to share the Gospel, this is the duty of every baptized Christian! By this point in this post I’ve actually covered a lot of what to say in actually sharing the Gospel. The Gospel is Jesus, so anytime that we are sharing Jesus, we are sharing the Gospel. Merely sharing belief in God or belief in the Catholic Church is not sharing the fullness of the Gospel. As I believe Pope John Paul II said, if we haven’t shared Jesus Christ, then we haven’t shared the Gospel. Practically, the best way to share the Gospel is in a conversation with a friend. We share who Jesus is in our actions and words, but actually sharing “the Gospel” is something that we need to actually speak. Another quote that I’m remembering is that “every single time that the Gospel is shared, something happens.” People won’t always welcome it or change their lives right there, but that’s an experience that should stick with them for the rest of their life. God actually gave us a model for how to share the Gospel when He gave St. Catherine of Sienna (1300’s) the “cross bridge” image to communicate aspects of salvation in Christ. 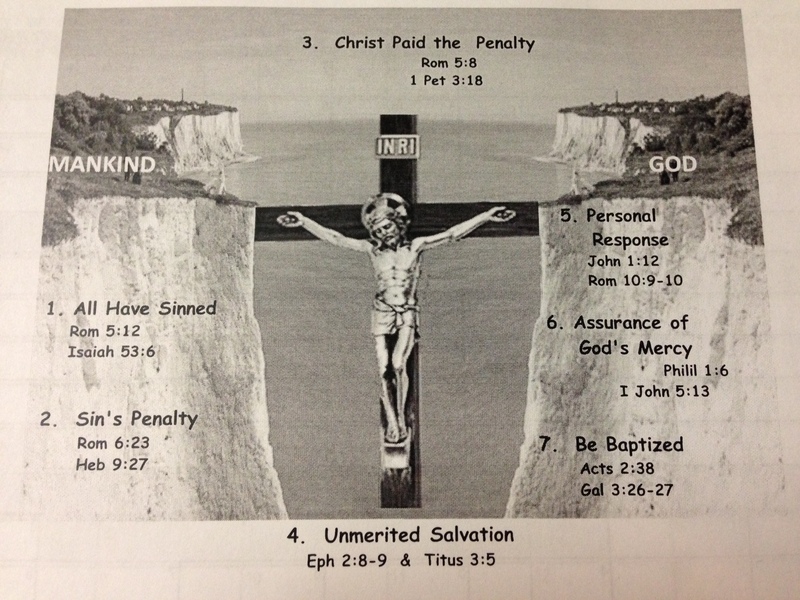 I’m not sure if this is the actual image but this is a basic picture of it, with some verses to back up each step in salvation. Check out those verses! It is so powerful to read them all in order. A great way to follow up sharing the Gospel is to invite your friend to join you in prayer inviting Jesus into their life. Update: Check it out! My friend Andrew and I filmed a simple Gospel presentation for your benefit right here! I was feeling a little out of touch with the Big Man, so I threw up a prayer.. “God, please remind me of your great love for me and us all.” Well, just a few moments later my thoughts started drifting.. I thought about a situation where someone had a bad heart and was going to die without a heart transplant. I had to ask myself.. if someone I loved needed a heart, would I give them mine? I would surely give my child my heart, my life, right? I would surely give my life for my family or close friends, right? What a tough situation. I was dwelling on it and really thinking, would I give my life for a loved one? I think so. I hope so. I pray that if I ever am in that situation, I would have the strength, courage, and love to do that. (Tangent paragraph alert!) It would be crazy, I would literally be giving away my life for another. For most atheists or agnostics that would probably be seen as a “waste.” They’d probably say that sure, do what you want, but you don’t have an obligation to be hero or anything. The thing about Jesus and Christianity is that, like a good parent or friend, Jesus challenges us to be the best that we can possibly be, no matter what the sacrifice might be. The ultimate good isn’t pleasure or personal gain but true love. But what about a situation where I was in the position to offer my heart for someone that I had never known, or even to someone who was mean to me? Would I do it then? Would you do it then? All of a sudden it clicked. I realized the connection: Jesus is like our “heart donor.” Jesus Christ, God, gave His life for us while we were sinners. While we had wronged Him. While we had turned from Him. Despite all of this, His love for us prevailed. I don’t know if I would be strong enough to give my life for someone who hurt me in the same way that we all hurt Jesus. But He did it anyways. Talk about love. Talk about courage. Talk about strength. Now that’s a hero. Imagine that you were the recipient of someone you don’t know’s heart. They gave their life for you. Wouldn’t you live life with purpose?! Wouldn’t you want to honor your hero and savior in everything that you do?! Wouldn’t you want to find out more about him or her?! This all was going through my head, the Spirit sure was working. 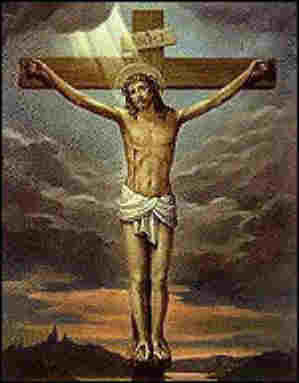 And wow, to think that I wouldn’t have the life that I have without that perfect sacrifice. To think that I owe everything that I am to Christ. That’s motivation. Jesus is our “heart donor,” the one who gave His life so that we could live. You are loved. You are loved more than you could ever know, whether you realize it or not. The Lord of everything, the God who created the heavens and earth, created YOU out of selfless love. He doesn’t need you. He doesn’t need anything, He is God. But He gave you life, like a Father, so that you could come to love Him in return, so that you could be like “brothers and sisters” to Him. He is gentle, though, He doesn’t force anyone to do what He wants them to do- we have free will, which allows us to love and do the Father’s will. He doesn’t even announce His presence anywhere but in our hearts, in our souls, and even there, He whispers. Even if the very earth is crumbling, in all of the travesties of life, even if we are martyred all alone, He won’t leave us. He asks us to be courageous, to live lives of faith, of hope, of love. He asks us to strive for a relationship with Him. We mess up, though. We often do not live as God created us to, choosing to sin- rejecting God. But as well as we live as children of God in this life, there is nothing that we can do to earn our salvation without the gift of the incarnate Son, Jesus Christ, God becoming a mere human, who bore all of our sins by dying on that cross about 2000 years ago. 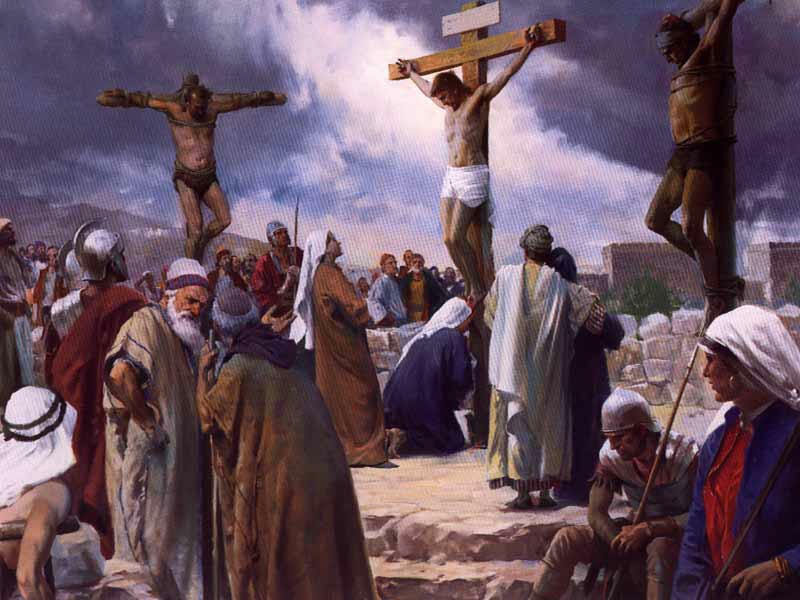 He died so that even the most hardened sinners would still have the opportunity to repent for their sins and still achieve salvation, like the thief crucified next to Him at Calvary. We all have that opportunity of everlasting life, a return to how we were supposed to live, if we believe in Jesus, repent of our sins, and strive to live as children of God to the best of our abilities, strengthened and nourished by the gifts that Jesus gave us, namely the Church and the sacraments- baptism, confirmation, reconciliation, and finally the Eucharist in mass, where we receive the Body and Blood, Soul and Divinity of our Lord who died for us as a perfect sacrifice to atone for our sins. Live joyfully, beloved! Our Father, God, loves us more than we could ever imagine. We are all children of God.